The rate and extent of focal adhesion formation and maturation are regulated by factors such as synergistic integrin–syndecan signaling and alternating activation cycles of Rho (Rac1, Cdc42 and RhoA) GTPases. Rho family GTPases Cdc42, Rac1 and Rho act at different regions in a cell (indicated by arrows) to orchestrate migration. Cdc42 generally controls the cell polarity and the formation of filopodia and nascent focal adhesions (shown as yellow dots). Rho influences cell adhesion assembly and maturation, in addition to controlling stress fiber formation and contractile activity. 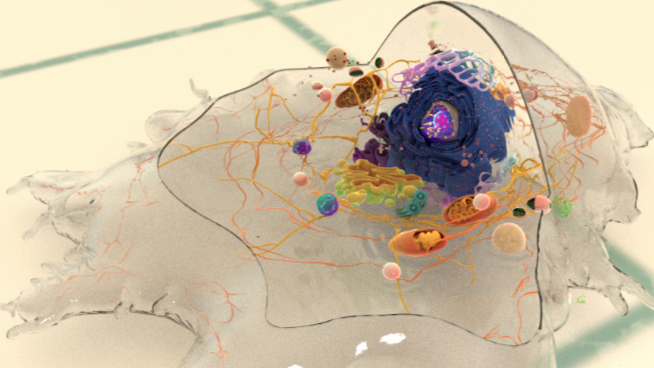 Rac1 primarily controls actin assembly and nascent adhesion formation in the lamellipodium. Neither syndecan nor integrin is capable of independently supporting cell adhesion or spreading. Despite the cooperativity of integrin-syndecan pairs in various contexts (reviewed in ), recent studies have established synergistic signaling by integrin β1 and syndecan-4; they play cooperative yet distinct roles in cell spreading and maturation of adhesions as well as directional migration respectively . The receptors co-localize in early adhesion sites at the leading edge with ligand binding by both receptors (e.g fibronectin binds via cell binding domain [RGD to integrin and via HepII domain to syndecan) being necessary for downstream signaling . This is crucial as the cell polarity and migration is determined by differentially regulating signals at the leading and trailing edges. Migration comprises of cycles of membrane protrusion, attachment, and cytoskeletal contraction, which causes forward movement. Immobilization of the integrin ligand is absolutely necessary to generate tension for adhesion formation and actin bundling while syndecan signaling primarily helps sense the environment for membrane protrusion. Localized signaling happens through alternating activation cycles of GTPases Rac1 (lamellipodium) and/or Cdc42 (filopodium) and RhoA, regulated by protein kinase pathways at the leading edge  (reviewed in ). This schematic highlights the signaling pathways that play a significant role in mediating GTPase-regulated protrusion in the lamellipodia and the differential adhesion dynamics various regions of the cell. FAK signaling is important at all stages of the adhesion life cycle while kinases such as PAK and ROCK influence later stages by promoting actomyosin contractility. PAK is highlighted in green during maturation to indicate that is it activated earlier by Rac and not by Rho. Adapted from [17, 18]. Stable adhesion induced by Rac1 may initially support tension, which allows RhoA-mediated contractility and pulling forces to impart stability on the bonds, thereby generating subsequent signals that are disseminated to the rest of the cell or axon ; these signals serve as feedback loops to restrict the direction of protrusion and reduce local activity of Rac1 , . It is to be noted that either receptor contributes to the regulation of both GTPases, however, Rac1 is primarily influenced by syndecan-4 . Coordination of such complex signaling is rendered by guidance signals. While α5β1 integrin activates Rac1 by regulating both localization to leading edge and GTP-loading, syndecan-4 influences only the GTP-loading (reviewed in ). Integrin signaling and nascent adhesion formation recruits GEFs such as Dock 180 and PIX for Rac and Cdc42 at the leading edge, activating them. It also inactivates p190RhoGAP while PKC α activation downstream of syndecan-4 sequesters it the membrane to suppress Rho activation. PIP2 is indicated on the membrane in pink. PKCα activation also aids further Rac1 activation and ensures sustenance of Rac1 activity at the leading edge by lipid distributions (not shown). Adapted from . Upon ligand binding, integrin signaling recruits GEFs for Rac1 and/or Cdc42 in lamellipodia and filopodia respectively . These initiate basal level Rac1 activity required for initial cell spreading , coordinated by Src–FAK signaling pathway  (reviewed in ). Further, liganded integrins retain active Rac1 at the leading edge by mediating a transient lipid redistribution which localizes GTP-Rac1 to the membrane . During this relocation, the interaction of Rac1 with Rho-GDI is disrupted, allowing p21-activated kinase (PAK) coupling . In the lamellipodium, PAK promotes actin polymerization by inactivating cofilin and aids spreading by suppressing local myosin activity periodically . It also aids actin reorganization in the lamellae . Upon engagement, syndecan-4 forms a ternary complex with PKCα and PIP2 ,  and its oligomerization leads to activation of PKCα . This is a critical step for further GTP-loading of Rac1, restricting Rac1 activity to the leading edge and environment sensing for directional migration . These facilitate downstream signaling for Rac1-mediated actin protrusion . It is highly critical to suppress contractile signals during protrusion to aid forward movement and adhesion turnover. This is achieved again through convergent receptor signaling that retains RhoA inactive during Rac1 activity at the leading edge . On integrin β1 engagement, FAK phosphorylates and inactivates p190RhoGAP required for RhoA activation (essential role) . It then gets docked in the membrane fraction by binding p120RasGAP and FAK , and syndecan-4-mediated redistribution to membrane ruffles  (modulatory role). Further, p190RhoGAP phosphorylation triggers another wave of integrin-dependent lipid distribution that sustains RhoA suppression until the cell is fully spread. 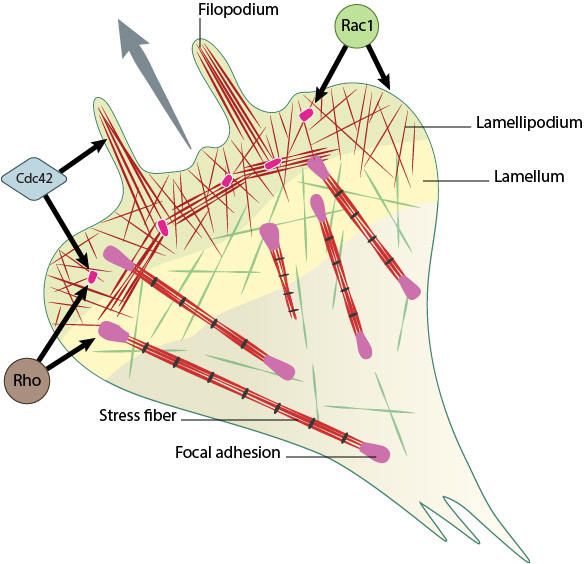 The precise reciprocal feedback mechanism through which RhoA is activated in the lamellae during adhesion maturation/disassembly remained unclear until recently. 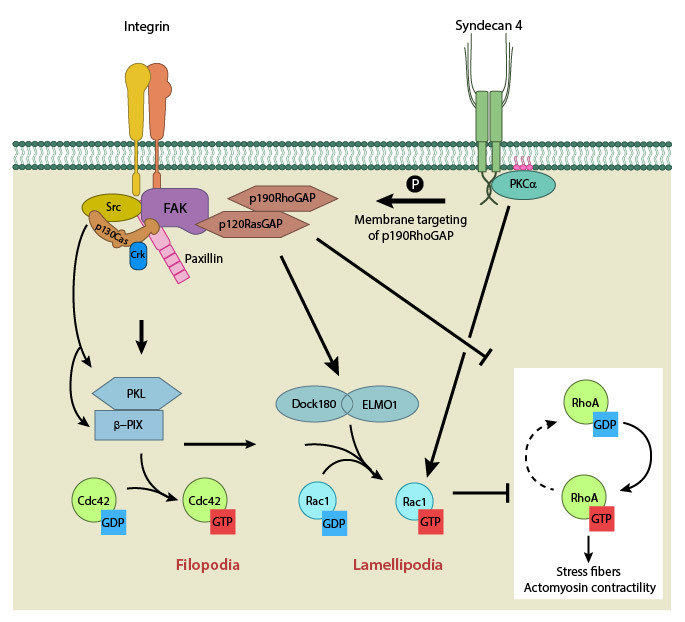 However several lines of evidence exist for involvement of integrin– and syndecan-signaling pathways. Besides reorganizing actin, Rac-activated PAK also phosphorylates the regulatory light chain (RLC) of myosin II, thus activating bundling of actin and the contractile mechanism. Myosin IIA/Myosin IIB-mediated actomysoin bundling generates stable adhesions, inhibit Rac-GEFs in the vicinity by modifying adhesion components that aid their recruitment and thus establish the cell rear . In a force-dependent manner, Rho-specific GEFs have been shown to get activated and recruited to focal adhesions through FAK and Fyn  (reviewed in ). Thus integrin-signaling pathway activates RhoA. Similarly, a syndecan-4 dependent pathway has been shown for the formation and maintenance of stress fibres, and focal adhesion maturation. Upon syndecan-4 clustering, GTP-loading of RhoA increases in a PKCα-dependent manner . Activation of RhoA further enhances contractility and builds cellular tension through the Rho kinase, ROCK which sustains the myosin RLC phosphorylation (reviewed in ). Tension-dependent decrease of Rac activity has been demonstrated [ 16129884[/cite] and is believed to happen through stimulation of a Rac-GAP, ARHGAP22 by the Rho kinase, ROCK . Similarly CdGAP, has been shown to inhibit lamellipodial protrusion and is suggested to do so via its actions on both Rac and Cdc42 .